‘Axis of Unity’ in Latin America Could Be Growing Threat for the U.S.
WASHINGTON — For all its anti-American bluff and bluster, oil-rich Venezuela should be merely a thorn in the side of the world’s greatest superpower, and not a serious threat. But link it with a country a third of the way around the world — Iran, flush with its own oil money and fueled by a similar affection for hating the U.S. and its ties to terrorism — and some analysts fear a cauldron could be heating to a rapid boil towards America’s south. Since 2001, Iranian President Mahmoud Ahmadinejad and Venezuelan President Hugo Chavez have indulged in a high-profile friendship. They bask in their cozy camaraderie, and they have openly invited other Latin American countries, including Nicaragua, Cuba and Bolivia, to join their anti-American fraternity. Ahmadinejad and Chavez have called themselves the “Axis of Unity.” Some security experts call them something else: a potential threat to American security. “There are two things they have in common – one is their hatred of the United States, and the second is oil,” says Roger Noriega, former assistant secretary of state for Western Hemisphere affairs for the Bush Administration. And they’re using their oil money to do it. Iran’s warming relationship with Venezuela has generated nearly 200 bilateral agreements, including increased cooperation between the two in the financial, metals and oil industries. Ahmadinejad has also welcomed Nicaragua’s Daniel Ortega to Iran on several occasions and pledged to rebuild a $350 million sea port on Monkey Bay on Nicaragua’s Caribbean coast. Ahmadinejad has even pledged a $1 billion investment package to the socialist government of Evo Morales in Bolivia. 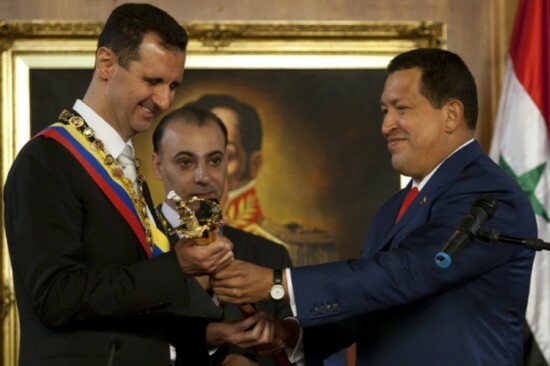 Chavez, too, has courted his Latin American neighbors by pledging lavish monetary gifts and oil. In a recent address from the Venezuelan capital of Caracas, Chavez urged Nicaragua, Bolivia and Cuba to “put together a common defense strategy and create our armed force” against the United States. Similar to Iran in the Mideast, Chavez is positioning himself to be Latin America’s main opposition to the United States. In a show of military might, Chavez deployed military to the Colombian border on Sunday and engaged in a war of words in a response to Colombia’s anti-guerrilla raid into Ecuador. Colombia and the United States say Chavez is providing support to Colombian rebels. Chavez says the U.S., a staunch ally of Colombia’s President Álvaro Uribe, is orchestrating the conflict in Colombia. “We are not going to permit the North American empire, which is the ruler, to allow his lapdog, President Uribe and the Colombian oligarchy, to divide or weaken us. We will not permit it,” Chavez said in a televised address. Noriega and Otto Reich, former U.S. Ambassador to Venezuela under President George H.W. Bush, and former Assistant Secretary of State for Western Hemisphere Affairs under the current administration, say they are concerned that the Chavez-Ahmadinejad alliance could enable the two countries to conspire to give Iran a strategic military toehold in the Americas, or to work clandestinely to advance Tehran’s nuclear program. In 2005 Chavez opposed a United Nations resolution condemning Iran’s nuclear ambitions, and a year later Frank Urbancic, a chief counterterrorism official at the State Department, testified to Congress that Venezuela has “demonstrated a complete lack of cooperation with U.S. government efforts to fight terrorism,” courting “radical rogue regimes” including Iran. “We really should be concerned because both Iran and Venezuela are self-described enemies of the United States, and when someone says they are your enemy you should take them at their word and at the very least, try to prevent them from hurting or damaging you in some way,” said Reich. A recent FOX News/ Opinion Dynamics Poll showed that more than 75 percent of those asked see the growing friendship between Iran and Latin America as a threat, with 35 percent of them calling it a major threat. Click here for poll results. But among the presidential candidates who stand to inherit this situation next year, the issue is rarely invoked. When contacted by FOXNews.com, only two campaigns chose to weigh in on Iran’s courting of Latin America and Chavez’s anti-American campaign. John McCain’s team issued a statement the Arizona senator made last April: “Hugo Chavez is using his country’s oil revenues to establish a dictatorship, bully his neighbors and succeed Castro as Latin America’ leading antagonist of the United States,” McCain said, blaming the politics of oil. Barack Obama’s campaign said the Illinois senator was concerned about the growing closeness to Iran among anti-American leaders in the hemisphere, and he would aggressively pursue diplomacy to ensure that the U.S. does not get frozen out by a volatile coalition in its own backyard. But not everyone thinks matters are yet out of hand. When asked about the burgeoning friendship between Iran and Venezuela, the State Department demurred. “Every country’s free to determine for itself who they’re going to have diplomatic relations with,” State Department spokesman Tom Casey said in a Jan. 25 briefing. In fact, some see Iran’s foray into the Americas as a lot of bluster, with little real impact so far. As for the threat to the U.S. – there is no evidence of either at this time, regional analysts say. “There is a lot of push and pull here, and Venezuela has a very active foreign policy in the region and will do everything it can to bedevil Uncle Sam, and if that means embracing Ahmadinejad, that’s what’s going to be done,” said Larry Birns, director of the Council on Hemispheric Affairs in Washington. Although U.S. officials say they are monitoring the situation, especially growing tensions over Colombia, analysts play down the threat the Iran-Venezuela relationship has to U.S. national security, saying that a creeping enemy influence in the Americas is more of a Cold War hangover than a reality at this point. And what about all that money Iran pledged to Latin America? Alex Vatanka, security editor at Jane’s Defense and Security Group, a U.K.-based intelligence service, said there is little evidence that much of the investment, trade and joint projects Iran has brokered has even materialized. “I think at the outset it would be quite useful and prudent to remember that when we’re talking about Iran in Latin America, we’re talking about involvement from an almost-zero level – we’re not talking about the consolidation or takeover of any state,” Vatanka said. He pointed out that China’s investment in Latin America is far more substantial than Iran’s. According to Chinese news reports, Beijing invested nearly $900 million dollars into Latin America last year, much of it in petroleum products. It also imports and exports billions to the region each year. But they recognize the Chavez-Ahmadinejad alliance could prove troublesome on one major front: oil. In February, a symbolic first shot was fired off in what may be the so-called “economic war” Chavez vowed to wage against the United States. Chavez broke off commercial ties and suspended oil exports to Exxon Mobil Corp. in retaliation for a lawsuit filed by American’s largest oil company to seize Venezuelan oil assets. Exxon secured a court order freezing $12 billion it says is owed to it after Chavez seized a crude project last year. Chavez has also threatened to cut off oil supplies to America. Another concern is that Iran and Venezuela are also both founding members of the 13-member Organization of the Petroleum Exporting Countries (OPEC), which is behind 55 percent of the crude oil on the market today. Global oil prices depend, in part, on fluctuations in OPEC oil production, which is set by the member groups.